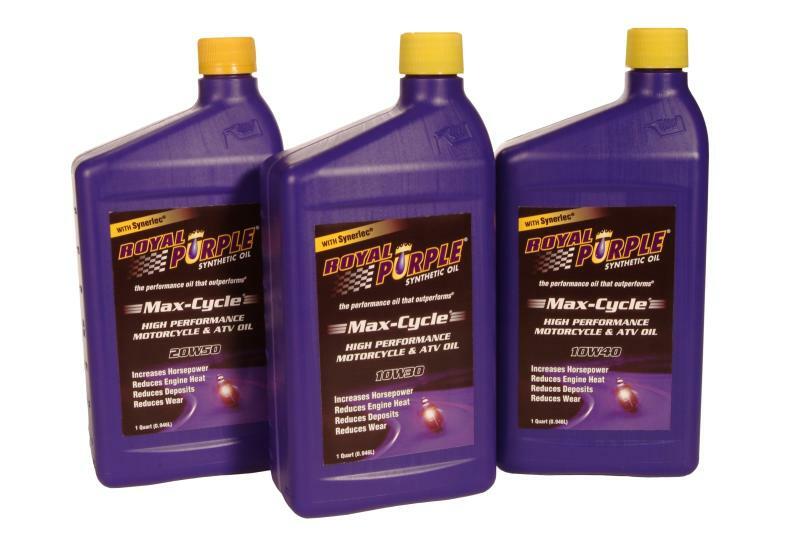 Royal Purple Max Cycle Motorcycle Oil UNIVERSAL - Lesher Motorsports, Inc.
Max-Cycle synthetic engine oil is available in 10W-30, 10W-40, and 20W-50, and is specifically formulated to exceed the demands of highly stressed motorcycle engines and transmissions. It is recommended for use in both air-cooled and liquid-cooled 4-cycle engines and is compatible with wet-clutch transmissions. Max-Cycle’s high film strength dramatically reduces wear. Improved combustion and reduced friction help to prevent overheating and to extend the life of the oil and the engine. The advantages of running Max-Cycle in motorcycle engines are clear. In an independent test conducted on an American-made V-Twin motorcycle, engine temperatures were reduced 25˚F – 44˚F just by switching to Royal Purple.